Top 10 Health Benefits of Lemongrass - 9jabook & Tweeterest Digital Network ! Lemongrass, also called fever grass, is a perennial plant with thin, long leaves that is indigenous to many Asian countries. As the name implies, lemongrass smells like lemon, but it tastes milder and sweeter. This herb is used in various Asian cuisines as a flavoring agent due to its potent flavor. Nutritionally, lemongrass is a good source of vitamins A and C, folate, folic acid, magnesium, zinc, copper, iron, potassium, phosphorus, calcium and manganese. It also has minute traces of B vitamins. Along with its culinary uses, lemongrass is useful in alternative or complementary remedies for a wide range of ailments. It has many beneficial medicinal properties including analgesic, anti-inflammatory, antidepressant, antipyretic, antiseptic, antibacterial, antifungal, astringent, carminative, diuretic, febrifuge, galactogogue, insecticidal, sedative, and anti-cancer properties. The leaves, stems and bulb of lemongrass are used in various treatments. Fresh and dried lemongrass are readily available in the market. You can also get lemongrass essential oil and supplements. Lemongrass tea is most often used in home remedies for various health issues. You can brew the tea by steeping one teaspoon of fresh or dried lemongrass in a cup of hot water for about 10 minutes. Strain, add any desired sweetener and your tea is ready. You can also buy ready-to-use tea bags. 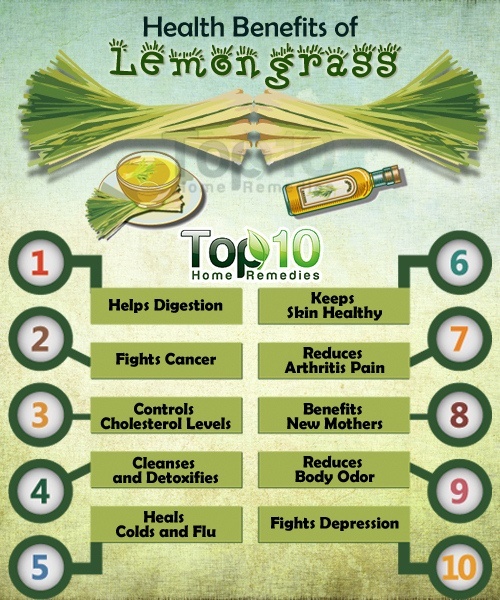 Here are the top 10 health benefits of lemongrass. Lemongrass promotes healthy digestion. It has antiseptic compounds that effectively kill bad bacteria and parasites in the digestive tract and repopulate the good bacteria in the colon. This in turn helps treat digestive health problems like indigestion, constipation, heartburn, diarrhea, bloating, flatulence, stomach spasms, vomiting and cramps. Plus, lemongrass has antimicrobial properties that help relieve gastroenteritis. For a healthy digestive tract, drink lemongrass tea on regular basis. Lemongrass tea, however, is not recommended for small children. The anti-cholesterol and anti-atherosclerosis action of lemongrass helps reduce the absorption of cholesterol from the intestine. Plus, it helps in the oxidation of LDL-cholesterol in the blood, which in turn helps prevent atherosclerotic plaque buildup. A University of Wisconsin study in 1989 found that people with high cholesterol who took 140-milligram capsules of lemongrass oil daily noticed reduction in cholesterol levels. They also experienced a significant decrease in blood fats. The high potassium content in lemongrass also helps lower and regulate blood pressure. Simply drink a cup of lemongrass tea everyday to help lower your cholesterol level and reduce blood pressure. You can also take this herb in supplement form after consulting your doctor. Regular consumption of lemongrass tea helps cleanse and detoxify the body. The diuretic nature of lemongrass helps remove toxins, uric acid and bad cholesterol from the body by increasing the frequency and quantity of urination. Urination also helps clean out the kidneys. Plus, the cleansing properties of this herbal tea help purify the liver, kidneys, bladder and pancreas. It also plays a key role in increasing blood circulation, which is important for overall health. Drink lemongrass tea on a regular basis to help your body get rid of harmful elements. Lemongrass has antibacterial and antifungal properties that help your body cope with coughs, fever and other cold and flu symptoms. Plus, it is loaded with vitamin C that boosts your immune system to fight the infection. You can use lemongrass oil to relieve pain in muscles and joints, as well as headaches resulting from a cold or the flu. Plus, lemongrass can be effective in breaking down mucus and phlegm buildup, which can alleviate problems with breathing. This is mainly beneficial when suffering from bronchitis or asthma. You can make the following medicinal drink with lemongrass. Boil a few fresh strands of lemongrass, two or three cloves, a small piece of cinnamon stick, one teaspoon of turmeric powder in one cup of milk. Strain and drink it when it cools down. Drink this once a day for a few days. Research at Ben Gurion University in Israel has shown that lemongrass tea can help fight cancer. A component called citral found in lemongrass causes apoptosis in cancer cells without damaging healthy cells. Simply put, it causes the cancer cells to commit suicide. In fact, to help the healing process, cancer patients in Israel are encouraged to take fresh lemongrass tea while undergoing radiation or chemotherapy treatments. Another study published in 2009 in the journal Fundamentals of Clinical Pharmacology found that citral in lemongrass slows the growth of breast cancer cells in the laboratory. Plus, there are several antioxidant properties in lemongrass that help lower your risk of cancer by fighting free radicals. Due to its anti-inflammatory and pain-relieving properties, lemongrass helps treat arthritis, rheumatism, osteoarthritis, gout and other types of joint pain. Its anti-inflammatory properties help suppress the activity of cyclooxygenase-2, an enzyme involved in inflammation that causes pain, especially in joints. Plus, lemongrass helps to alleviate muscle spasms or sprains by relaxing the muscles, which in turn reduces the pain-related symptoms. You can mix lemongrass oil with coconut oil in a 1:2 ratio and rub it over the affected area. Leave it on for a few hours before rinsing it off. Do this daily for a few weeks. You can also drink lemongrass tea twice daily for best results.